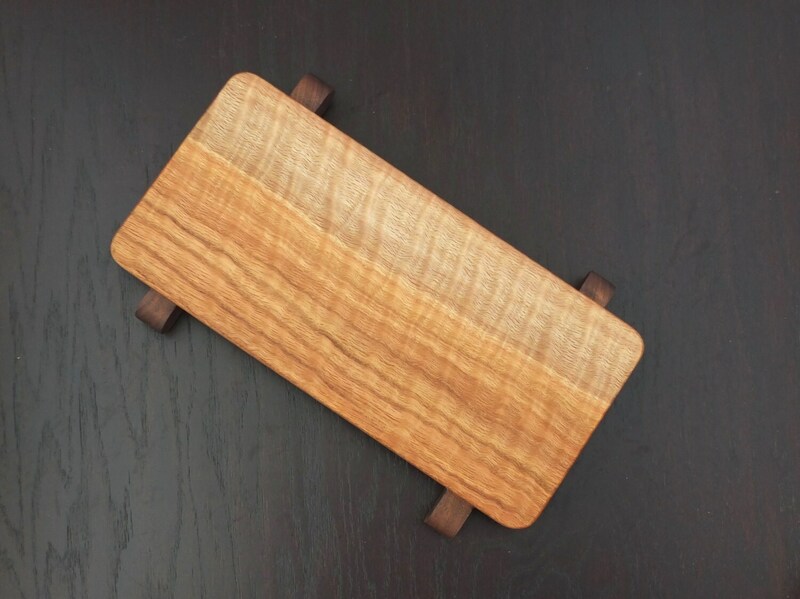 Unique Curly Oak sushi board, cheese board or charcuterie board. Beautiful hostess, anniversary, wedding or housewarming gift! 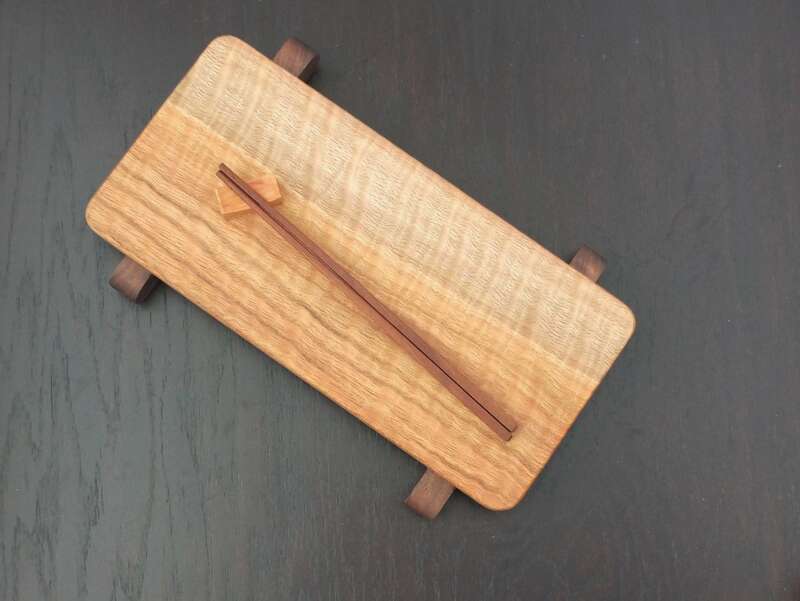 This elegant sushi or serving board features beautiful, unique curly oak to create a serving piece that looks lovely on any table. Walnut feet compliment the beautiful figure in the maple. Curly Oak looks incredibly dimensional, but is as smooth as glass. Boards with this amount of figure are rare and very difficult to find. It will be an elegant addition to your kitchen! 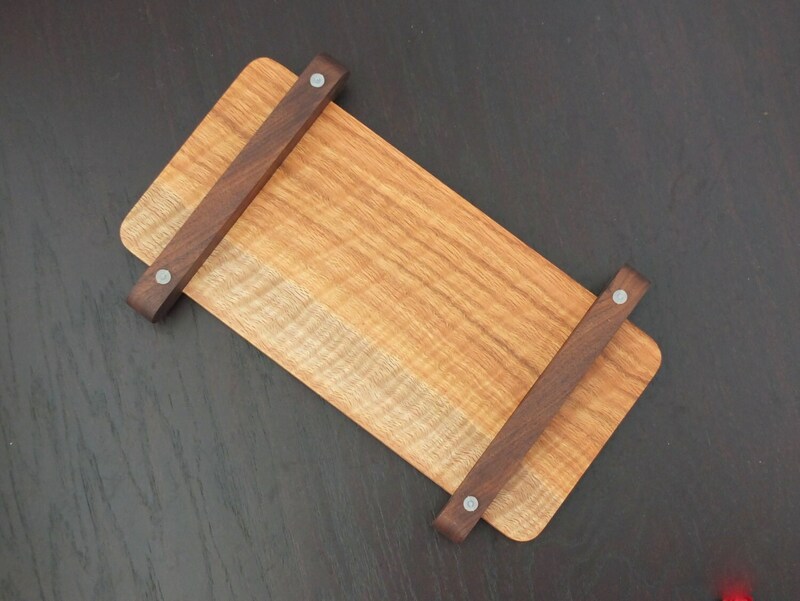 This serving board is perfect for sushi, breads, cheese, crackers and other appetizers. As with all our items, this serving board can be personalized with a name or initial for no additional charge. Item Size: 7 1/4" x 18 1/2" x 3/4". Stands approximately 1 1/2" tall. Chopsticks are not included, but can be ordered separately in our shop. Our serving boards are finished by hand, given several coats of food grade mineral oil, then sealed with a hand-rubbed coat of our special beeswax board butter. We use only North American hardwoods, preferring to source our materials locally rather than get exotics shipped from other continents or bamboo, which is loaded with fillers in order to produce a wood-like material from a grass. We search the Great Lakes region for wonderful wood for our cutting and charcuterie boards. The wood with the most beautiful, unusual grain is used for our charcuterie boards, which show off the grain to perfection. We make our cutting boards in Midland, Michigan, using only North American hardwoods.